Updates only by WiFi not mobil. Even on WiFi no update has come in since early march. 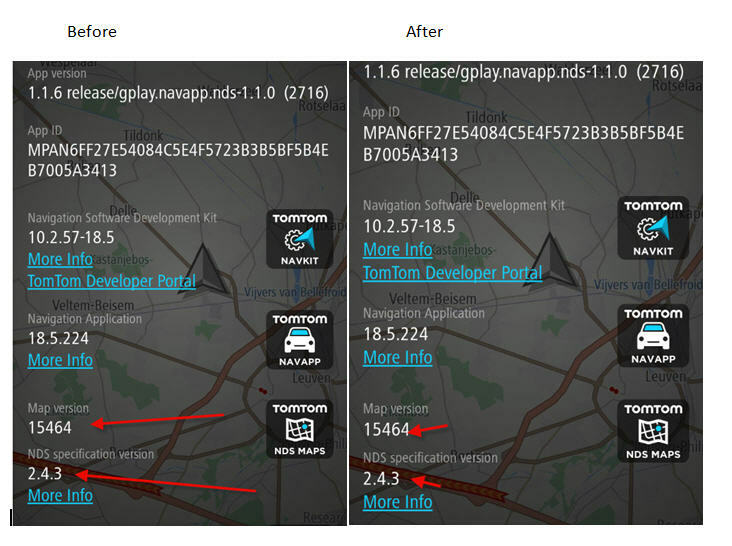 I know the maps are outdated because the regular TomTom Go Mobile app has had his updated and in my area there has been some road changes, that are correctly displayed in the regular TomTom app, but not in the NDS app. Last edited by dennismoore; 15th April 2019 at 04:27 AM. You can test by downloading one of the South American maps and see if they are newer. **Data storage constraints may apply and an SD card may be required. Download 4 or more full updates of any installed map per year. You need a wireless internet connection to download new maps and updates. Last edited by asprin624; 15th April 2019 at 05:16 PM. Just installed this version from post #1 on Android car HU Oreo/PX5 stock ROM. After selecting recorded sound (Ervin/HUN) it starts speaking and speaking infinite. You have reached your destination, turn left, turn right, etc until I switch back to TTS. Any idea what could cause the issue? You are lucky to get it to work on a 3rd party Head Unit. In the TomTomLab menu I was able to switch to the platform TTS, which voice is far better than the TomTom one at least in Hungarian. Sounds more natural not so robotic voice. So no need of recorded voice. Good news, there are new road maps. Last edited by Golom; 16th April 2019 at 06:36 PM. Last edited by dennismoore; 16th April 2019 at 04:24 AM. Before we start deleting maps!!!!!!! I just did a test and there are no new maps yet. See same version numbers, but 244 Mb instead of 220 Mb. Also marks up to date in maps list.